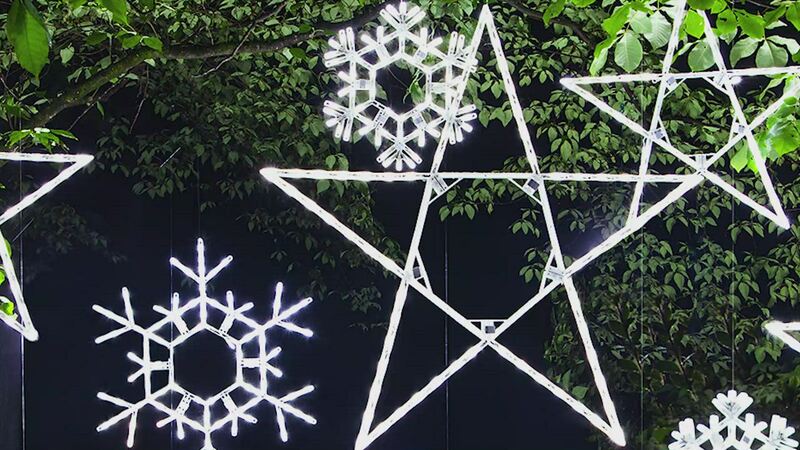 Bring the wonder of the night sky to your Christmas lights display with 32" folding stars featuring 50 cool white 5mm LED mini lights! You'll experience long lasting, superior quality construction and brilliant illumination while saving time and money with this convenient, energy efficient LED Christmas decoration. Hang these large, vivid stars above the mantel, across the porch or among the branches of outdoor trees to add festive glow indoors or out, then fold them up and store away in a quick, hassle free process! The product is as promoted. Thank you for your good product and for the prompt service. Fantastic product. I have three of them on our lawn Christmas tree. I will send photos you desire. I was very happy with this item. It is bright and beautiful. Also, came very quickly. My daughter wants one! Nice, large star that was a snap to put together and looks very nice. The star is bright and lightweight. Instructions were easy to follow. Will definitely tell others and will look for other products with this company! I am very pleased with the folding star I purchased. The product is made well and arrived within a few days. We live in a high rise and the star can be seen vividly from across the street. I received this item in 3 days very happy with it would order again next holiday. A good product that meets my need. The lights could be brighter, but they are very adequate for a window display. We received the order promptly and it was exactly as described. We put 2 of them back to back on top of our flag pole and it looks fantastic. Very pleased with the product. Would even like to see one made 2 sided. This is a great product. It's easy to display and store and it's a beautiful item to hang on the house. I like the size of our star and storage size as well. Price and shipping total was a little high, and would like extra bulbs. This LED Folding Star was exactly what I wanted. I got the star after Christmas, but i did unfold it and plugged it in. I think this will be a great replacement for the folding star i did have that was destoyed in a wind storm we had. The large Star folds into a small very managable box for storage. Clever design; easy to fold and store. fast service and we are very happy with the quality of the star. Perfect for the space it was purchased for. I couldn't believe how hard it was to find a star. I am so happy that I found this site. Once ordered, delivery was quick! I love my folding star. It is beautiful and just what I was looking for. Will certainly be ordering from you again. Surprised on how soon it arrived. Would recommend your site to everyone. While the star was well made and a great size, the led lights make it look blue, a decidedly strange glow. Will try to replace the strand of lights, but not what I expected. great product. Simple to assemble. Folds away which will extend the life of product. Looks good. I have bought several of these folding starts before and they work great for my holiday display. I am disappointed with this most recent experience as I placed this order 1 week ago and it still has not arrived. Timely service, good value, very happy with the product.